Shop for the best deal on workers compensation with Employers Compensation Insurance Company. Affordable Workers Comp Coverage From Employers. Employers is a national workers compensation specialist. They are solely focused on workers compensation insurance and do not offer any other lines of P&C coverage. They offer some of the most competitive rates in the industry for target class codes, especially restaurants. 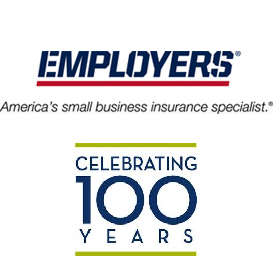 Employers recently celebrated their 100th anniversary as they began writing workers compensation in Nevada in 1913. Employers Insurance Company is an A Rated carrier.. Employers Compensation Insurance Company has a reputation for being unbeatable in their target class codes. While the write hundreds of industry classes, a significant portion of their annual premium comes from select business classes. Employers is one of the premier national workers' compensation markets for restaurant insurance. They offer some of the lowest filed rates in many states throughout the country and also have flexible payment plans to improve operational cash flow. Employers has been endorsed as the provider of choice by several state restaurant associations including Arizona and California. The company offers automatic premium discounts and policy credits in some states for members of various restaurant associations. Get an Employers insurance quote for your restaurant today. Our agency is a select member of Employers' Strategic Partnership & Alliance Division which gives us exclusive access to Pay As You Go and other specialized workers comp solutions. Employers offers one of the most cost effective Pay As You Go workers comp programs whereas the only down payment required is the state expense constant- Typically around $200 per policy. Employers is the only carrier approved in the State of Florida to offer an automatic 5% credit on all of their target class codes, making them the most affordable carrier in Florida. Employers offers an additional 5% credit for any members of the California Restaurant Association. Credit requires an active CRA membership number to qualify. Shop your work comp with Employers. At Workers Compensation Shop.com, we're a preferred partner of Employers Compensation Insurance Company and other national insurance companies. Let us negotiate the best price for your next workers compensation insurance policy. Get started finding your lowest workers compensation rates from Employers Insurance Company or one of our other insurance partners. Or give us a call today at 888-611-7467 to find out if one of our WC Specialist can help save you money on insurance.